Nobody wants to experience a receding hairline. It can seriously damage your self-confidence and change the way you look completely! Fixing it can be difficult and dangerous, but these researchers might have found a safer and more effective fix for baldness. According to the study, doctors can remove fat via liposuction and injecting it into your scalp. 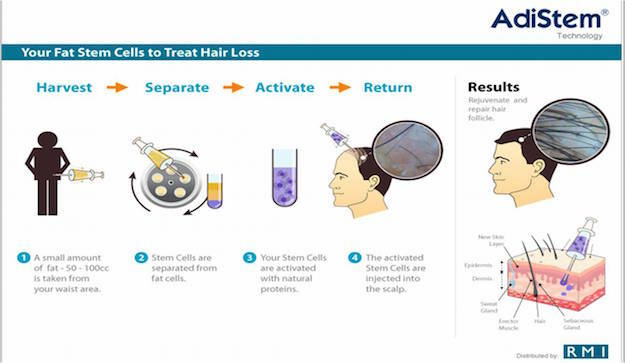 Scientists claim that the fat cells stimulate your hair follicles and increase hair growth. This procedure offers a way to regrow your balding hair and shrink your waistline. Although, liposuction does have its downsides. According to the Sun, the study results were very positive. They report that the researchers found a 93% increase in hair growth and 23% more hair count in just six months. The author of the study, Dr. Edward Ball says the results were very promising in finding an easier and more effective way to regrow their hair. According to Dr. Ball, “The most common form of male pattern hair loss is something called androgenic alopecia and it affects a substantial chunk of the population – 50 percent of men. And hair loss isn’t just a male affliction, with up to 45 per cent of women experiencing it too,” The Sun reports. Modern day hair loss treatment include pharmaceutical drugs like Finasteride and Minoxidil. Some people have allergic reactions and their bodies can’t handle this medication though. You can also have hair transplantation. Which more of a permanent hair restoration method. “The problem arises, however, in the fact that a hair transplant sometimes isn’t an option, particularly where hair loss is in its infancy, patients have diffuse thinning, or where there’s poor donor availability,” Dr. Ball says. “The other important thing to note is that autologous fat transplant has been shown to be well tolerated, as it’s been used for many years in other cosmetic surgery procedures to add volume to the face and breasts, in what’s called ‘lipomodelling’,” Dr. Ball says. PreviousPrevious post:This Man Grew His Own Cure For Skin Cancer In His BackyardNextNext post:The World’s First Fully Automated Toothbrush is Here – and it Only Requires 10 Seconds!